To Compromise or Not to Compromise? Yet again this proves a tough question. We are back to the detail of Sally’s grooming in The Thinking Tank, which we see in detail not, in my view for any salacious reason, but because we have to know just how bad Sally’s situation is to make sense of everything that happens to Sally later in her story. Once again, I was accused of titillation – and it makes me wonder whether I should compromise on the uncomfortable elements of my new title, Sleeping People Lie (November 2012). I know that what I write at times makes for edge-of-the-seat discomfort – maybe that’s a difficult place for readers to be – but if in watering down, we lose the nub of the catalyst, is that not removing something essential from the message I want to convey? But then I don’t want to offend people and lose readers either – so maybe the honesty should be reined in. Things like this always make me revisit my ideas – not a bad thing, maybe, but it drives home my own lack of confidence – and that’s an uncomfortable place for me! The Thinking Tank is made up of two stories in separate times. In 1969, we meet Sally, a young girl who attends church and dreams of playing guitar and performing in the Young People’s Fellowship band. She is soon groomed by Simon, a 22 year old police constable and stalwart of the church. The other story running alongside this is set in 2003, and we meet Sarah, a mother being cared for by her daughter Rebekah. Sarah is just embarking on a new treatment for her Reflex Sympathetic Dystrophy, having sessions inside a hyperbaric oxygen chamber (the `thinking tank’). Their relationship is very complex and appears from the start to be very strained. The blurb on the back was very intriguing, and I was really excited about starting the book as I was interested to see what lay ahead. I did enjoy The Thinking Tank. I will admit I wasn’t sure about it at the beginning. I found Sally’s story at the start difficult to get through, as the subject matter can be uncomfortable reading. Jae De Wylde did a fantastic job in making the story of Sally’s grooming so realistic as it seemed very real and throughout those sections, I just wanted to reach out to Sally. However, it was so realistic that at times it did make me feel on edge, but I persevered with it and I was glad I did because afterwards the story was even more gripping. Jae De Wylde has to be complimented on her characters and the interactions they have with each other! Jae effortlessly manages to create such complex and interesting characters and you can’t help but be drawn into their lives and their own personal stories. I was especially hooked by the relationship between Sarah and Rebekah; I enjoyed seeing how their relationship developed and how they dealt with the issues that life threw at them. As characters, they were so beautifully written and a lot of the time I felt as though I was stood next to them watching their scenes play out in front of me. I also want to note that I enjoyed the `relationship’ that Sarah has with the `thinking tank’, I thought that it was particularly well-written and added an extra layer and depth to the tale. After my initial wariness of the first few chapters, I raced through the book, unable to put it down and I was quite sad to finish it. I must say I am looking forward to picking it up and rereading it all over again. Jae De Wylde has obviously poured her heart and soul into this book and it showed, I felt that every word had been carefully selected and the story did reach out to me, and I found myself connecting with not only the characters but taking in the whole picture. It was descriptive, sensitive, thought-provoking and at times very honest, and I must say I enjoyed every bit. There were a lot of surprises in this book, the twists and turns were excellently placed and compelled me to read on. It’s not light reading but instead the story flows beautifully, giving the reader a refreshing, honest read that will make you stop and think. A fantastic novel from Jae De Wylde, and I am very much looking forward to her next one. 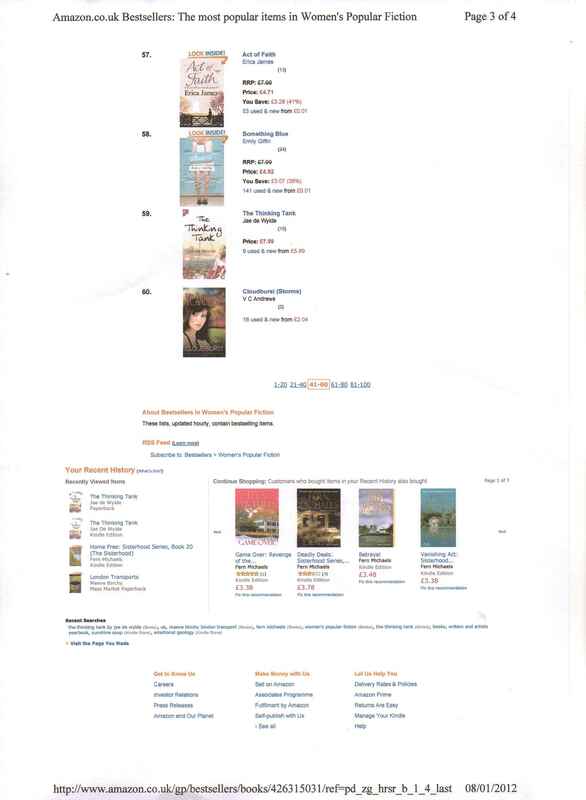 #57 on Amazon Women’s Fiction Bestsellers – definitely NOT life’s crappy stuff! Captured on screen at #59! And, OK, Jo Parfitt (www.joparfitt.com), you were right! An author’s ‘backstory’ really does make a difference. When the Gulf News Friday Magazine published my story by the excellent journalist, Antonia Hoyle (www.antoniahoyle.com), I felt like hiding under the duvet (www.gulfnews.com/life-style/general/belly-dancing-saved-me-from-my-grief-1.960098). I just had this idea that my novel was this separate entity, that needed to be other than me, rather than sharing my history and my sadness. Stupid, I know, when you look at it because what else does an author do other than pour out real emotions, layered onto the characters and their situations? Even so, my novel is fiction and I thought that my ‘backstory’ might somehow infect what I had created. I don’t do ‘poor me’ and anything that smacks of that just doesn’t sit well. But the support since last Friday has been incredible such that I would never have dreamed possible. Even people from my past have been back in contact. 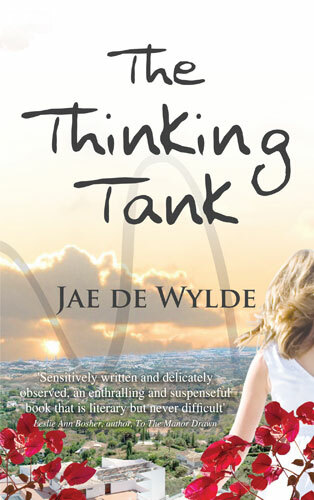 Then, on Sunday afternoon, The Thinking Tank went to #57 on Amazon Women’s Fiction. Extraordinary. Me, on Amazon’s Top 100 Bestsellers’ list? 23 places ahead of Costa Coffee Shortlister, Chris Cleave, and only 37 places behind the wonderful Jodi Picoult. That is just bonkers. So, Jo was right, I was wrong. There. I’ve said it. And a great big stonking THANK YOU to everyone who has been in touch. There are comments on the Friday magazine article – but most have come via FB messages or email. To know that my story has made a difference, to know that it has helped some of you who are bereaved take a baby step forward – that is huge. My treatment in the hyperbaric oxygen tank was like nothing else I had experienced. When you have a condition that is pain-related, it’s hard for people to understand what the whole fuss is about. I get that. We all get that, those of us who have silent illnesses – the sort you can’t wear, which aren’t signposted by crutches, slings, wheelchairs or sticks. So telling people I was to spend two hours a day, five days a week in an oxygen tank felt a bit like making a bad joke. It was even more difficult when I got to the hospital. HBO is used for diseases of the nervous system but also for open wounds that won’t heal. Sarah in The Thinking Tank encounters such a situation when she meets a woman with damaged tissue on her face. If I dig deep, I guess what it made me feel was a fraud. Like if I don’t have some outward badge of pain, then I can’t possibly deserve this treatment. And when you feel like that you get all apologetic for even being there. Hats off to the amazing staff at the former Edith Cavell hospital in Peterborough who were real earth angels and did all they could to make visits to the HBO unit like a coffee morning. But that alone-ness, when everything is cool and separate in the tank – even the earth angels could not fix that. Which is where the telly comes in – if you want it to. I’ve included a pic to explain a bit about how it works. It is surreal, so it’s hardly surprising that it’s hard to visualise. The monitor is outside the glass cylinder and sound – someone talking to you or sound from the TV – is piped in through an intercom system. And it works both ways. You can be heard too from the outside. It’s another way of making you feel less diconnected but the truth is, there is nothing like two hours in a treatment chamber to underline your disconnectedness – the fact that no one else on the planet can feel your pain – that pain is personal, be it physical or metaphorical, and let’s face it we all tend to think our own pain must be the worst. The truth is that whatever your worst is, is simply that – your own personal worst. We live by degrees. We get hurt by degrees. The more pain we encounter in life the more we are likely to cope with more pain – or if not, we go under. We each of us live life in our own tank. We just don’t always know when we are there – and we forget that to connect we need to reach out from our tanks, from our pain and from our own private worlds. Sarah gets stuck in hers and to move forward she has to uncover the secrets that keep her and her daughter apart.